Accomplishing a big project, a slab for example, can have a little bit of a deflating effect. 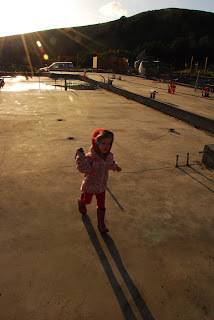 I felt so excited about the slab, and rightfully so, as it is such a significant moment in the sequence of our house. But now, the open road of endless construction tasks stretches out ahead of us again, and daily life intervenes to temper the pace of progress. Drew is leaving for five days to go to an aikido seminar, the garden calls, desperate for moon-appropriate action, taxes are due, and the yurt needs regular cleaning. So we breathe for a moment, inhaling perseverance to continue the one-step-at-a-time movement toward our distant goal, relaxing the desire for immediate gratification in the form of a fully constructed house. Yesterday, I replanted all the seeds I so lovingly sowed almost a month ago. We lost all the peas to gophers, and the tomatoes, peppers, and eggplants got nipped by a small critter who thought they would taste yummy just as soon as the poked out of the soil. I changed my trajectory, moving the hot weather crops into the yurt in hopes of speedier germination, and planting peas in a flat, covered with wire and bird netting. I'm going to try giving them a head start before transplant. I also transplanted out approximately 80 onions into the raised beds, and began preparing the bed that will contain the newest rounds of brassicas, carrots, beets, lettuce and spinach...spring garden!